Grand Canyon, Ariz. � At approximately 2:00 this afternoon, the Grand Canyon Regional Communications Center received a call from a park visitor reporting a man over the edge below Lookout Studio on the South Rim of Grand Canyon National Park. 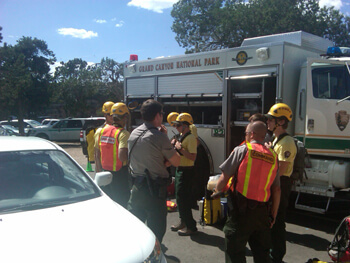 Park rangers responded and called in the park�s helicopter to help search for the body. The body was located more than 200 feet below the rim at approximately 2:30 pm. Upon locating the body, members of the park�s technical rescue team hiked a short distance down the Bright Angel then traversed the canyon�s edge to reach the body. 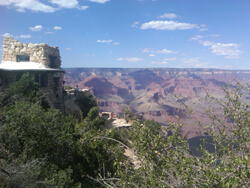 The man�s body will be flow out of the canyon via helicopter to the South Rim Helibase. From there the body will be transported to Station One, located on the South Rim adjacent to the Grand Canyon Clinic, where it will be met by the Coconino County Medical Examiner then transported to Flagstaff. Grand Canyon, Ariz. � A type III incident management organization is currently working to suppress the New Water Fire (previously referred to as Grand Wash Complex Fire) which include lands within the South Rim of Grand Canyon National Park, as well as lands managed by the Bureau of Indian Affairs �Truxton Ca�on Agency, the Bureau of Land Management - Kingman Area Field Office, and the Arizona Division of Forestry. Due to the increasing complexity of the fire a regional interagency type II incident management team has been ordered. The team will report for an in-briefing on Saturday, August 6, at 10:00 a.m. at Peach Springs, Ariz. They are scheduled to take command at 6:00 p.m. tomorrow. This lightning-caused fire was reported at approximately 5 p.m. on Wednesday, August 3. The New Water Fire is located approximately six miles east of Meadview, Arizona and fifty miles north of Kingman, Arizona and originated on private land adjacent to the park. The fire, which is burning in grass, brush, and pinyon juniper quickly spread across the park boundary. The size of the fire was estimated at 8,000 acres as of 10:00 a.m., Thursday, August 4. Two hot shot crews, two engines, two helicopters and two single-engine air tankers are working to suppress the fire; and containment is currently expected on August 8. Additional resources are being ordered to assist in the suppression effort. Values at risk: The uncontained east flank of the fire is approximately two miles west of Grand Canyon West on the Hualapai Indian Reservation.